Your use of the Environmental & Gas Monitoring Limited Web Site is subject to these terms and by using the Site you show your agreement to such terms. If you do not accept our terms, please do not use the Web Site. Environmental & Gas Monitoring Limited, our suppliers, advertisers and our personnel are completely dedicated to providing the highest levels of customer service. We will process your order as quickly and efficiently as possible and delivery is usually within 2-3 working days, dependent on the product or service being acquired. Details are contained within the product information provided. If you require any advice or assistance please call on +44 (0)1563 820444 lines are open between 9am - 5pm Monday to Friday. Environmental & Gas Monitoring Limited is dedicated to the development and marketing of novel diagnostic test kits that address topical concerns about the quality and safety of agricultural and food products. 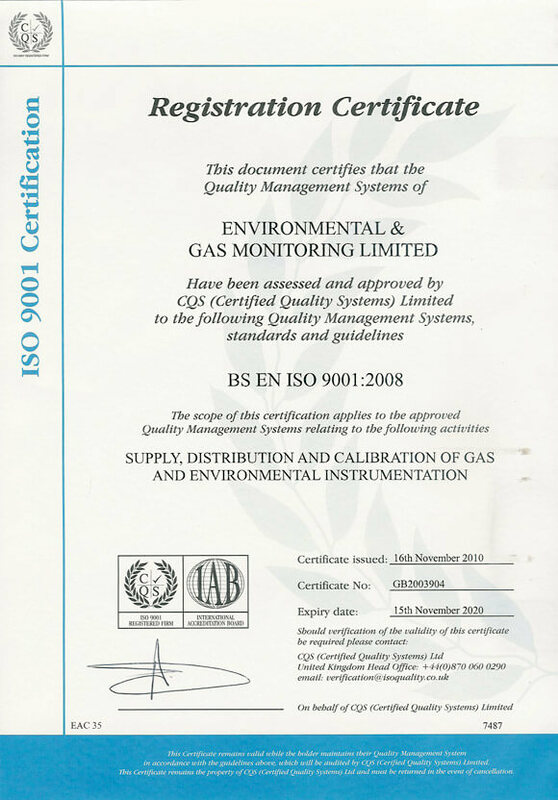 Established in 2000, Environmental & Gas Monitoring Limited is located in Galston, Ayrshire and offers a full range of world-class instrumentation and service fully supported by their ISO 9000 suppliers. A feature of Environmental & Gas Monitoring Limited is its strong customer base and technical and applications knowledge available within the company with key personnel having over 80 years experience. An important development for Environmental & Gas Monitoring Limited took place in September 2007 with the acquisition of KAD Detection Systems Limited, a company involved in the supply and distribution of Environmental Monitoring products for over 20 years. The images, logos and names on this Web Site which identify Environmental & Gas Monitoring Limited or third parties and their products and services are proprietary marks of Environmental & Gas Monitoring Limited and/or the relevant third parties. Nothing contained in this Web Site shall be deemed to confer on any person any license or right on the part of Environmental & Gas Monitoring Limited or any third party with respect to any such image, logo or name. Environmental & Gas Monitoring Limited reserves the right, at any time and without prior notice, to remove or cease to supply any product or service contained on this Web Site. In the event that such removal takes place we shall not be liable to you in any way whatsoever for such removal. Telephone calls using the telephone numbers provided on this Web Site and email correspondence with Environmental & Gas Monitoring Limited at the email addresses accessible through, or discernible from, this Web Site may be recorded or monitored. By using such communication methods you are consenting to the recording or monitoring of the same. The company accepting the payment is Environmental & Gas Monitoring Limited and that is what will appear on your statement. All payments are taken in Pounds Sterling (£GBP). The currency conversion facility on our website uses current exchange rates to convert the pricing display to your chosen currency. This may not be the same rate offered by your card provider at the time of purchase. Every order placed with Environmental & Gas Monitoring Limited is subject to a security check. These checks are carried out to protect both you and us against fraudulent transactions. Therefore all information entered by you must match the information held by the card issuer. Supplying incorrect or incomplete information will result in a delay in processing your order. If we are unable to confirm the identity of a customer we may carry out further security checks that may delay the processing of your order. As the supplier we reserve the right not to supply goods if we are unable to reach a satisfactory conclusion to a security check. If you suspect your card has been used fraudulently on our website please contact your card issuer immediately and notify us of the occurrence on +44 (0)1563 820444. This website uses the latest in SSL technology, giving you greater peace of mind and absolute security. In the payment pages the padlock will appear in the Status Bar indicating that you have entered a secure area. At this point all the information exchanged from your (The Customer) computer to ours (Environmental & Gas Monitoring Limited) is heavily encrypted, and guarantees that no one has unauthorised access to your details. Simply browse our catalogue and click on "Add" at the item you wish to buy and it will be added into your Basket. Once you have finished your selection, click on "Checkout" and you will be asked for your details. If you wish to make your purchase over the telephone please call one of our advisors on +44 (0) 1563 820444 Once you have placed your order you will receive an order confirmation by email or letter. Prices, and details, of products and services (and any offers) posted online are subject to change without notice. All products and services are subject to availability and we give no guarantee in this respect. The provision of details of products and services on this Web Site are not, and should not be construed as, an offer to sell or buy such products or services by Environmental & Gas Monitoring Limited or the relevant company either of whom may accept or reject your offer at its sole discretion. All attempts should be made to reasonably allow Environmental & Gas Monitoring Limited or the supplier to attempt to repair any problems identified. You should pay attention and make sure you inspect the product on delivery. Any damage should be noted by you and delivery agent on delivery form. Environmental & Gas Monitoring Limited or the supplier if ordered direct will be responsible for reasonably prompt repair of any damage. Environmental & Gas Monitoring Limited will ensure that products or services are delivered promptly and on time, in line with the product and / or service information supplied during the order process. However as with most service and product suppliers acts of God or unforeseen circumstances may prevail however Environmental & Gas Monitoring Limited and our suppliers will keep you informed of any undue delay. We must be notified by e-mail within 48 hours of receipt of goods if they are being returned and they must be returned within 7 days of receipt. Goods being returned must be unopened and in their original packaging in resalable condition. Return carriage cost is the responsibility of the purchaser and returned using Royal Mail Special Delivery for low cost items and Courier for high value items. This Web Site is for non-commercial, personal use only. The services contained on this Web Site may be supplied on a commercial basis on payment to Environmental & Gas Monitoring Limited or its service or product suppliers of its charges from time to time. Please contact us on +44 (0)1563 820444 or email [email protected] for further details. In the event that you use any of the services contained on this Web Site for commercial use, Environmental & Gas Monitoring Limited shall be entitled to charge you at its applicable rates in respect of such commercial use. the products and technology or processes described in this Web Site may be subject to other intellectual property rights reserved by Environmental & Gas Monitoring Limited or by other third parties with no license granted in respect of those intellectual property rights); images on this Web Site are protected by copyright as its text by IPR and may not be reproduced or appropriated in any manner without the written permission of their respective owner(s). Whilst Environmental & Gas Monitoring Limited has taken due care and attention in the preparation of the contents of this Web Site, this Web Site and the information, names, images, pictures, logos, icons regarding or relating to Environmental & Gas Monitoring Limited or our products and services marketed on the site (or to third party products and services), are provided on an 'as is' basis without any representation or endorsement being made and without any warranty of any kind, whether express or implied, including but not limited to, any implied warranties of satisfactory quality, fitness for a particular purpose, non-infringement, compatibility, security and accuracy. To the extent permitted by law, all such terms and warranties are hereby excluded. In no event will Environmental & Gas Monitoring Limited be liable, whether in contract or tort (including negligence or breach of statutory duty) or otherwise for any losses sustained and arising out of or in connection with use of this Web Site including, without limitation, loss of profits, loss of data or loss of goodwill (in all these cases whether direct or indirect) nor any indirect, economic, consequential or special loss. Environmental & Gas Monitoring Limited does not represent that the information contained in this Web Site is accurate, comprehensive, verified or complete, and shall accept no liability for the accuracy or completeness of the information contained in this Web Site or for any reliance placed by any person on the information. Environmental & Gas Monitoring Limited does not warrant that the functions or materials accessible from or contained in this Web Site will be uninterrupted or error free, that defects will be corrected or that this Web Site or the server that makes it available are virus or bug free or represent the full functionality, accuracy, reliability of the materials. If any of these Terms and Conditions (or any terms and conditions relating to a product or service referred to in this Web Site) should be determined to be illegal, invalid or otherwise unenforceable by reason of the laws of any state or country in which such terms and conditions are intended to be effective, then to the extent of such illegality, invalidity or unenforceability, and in relation to such state or country only, such terms or condition shall be deleted and severed from the rest of the relevant terms and conditions and the remaining terms and conditions shall survive, remain in full force and effect and continue to be binding and enforceable. Nothing in these terms and conditions shall exclude Environmental & Gas Monitoring Limited 's liability for death or personal injury resulting from negligence of Environmental & Gas Monitoring Limited. All Intellectual Property Rights (including, without limitation, all database rights, rights in designs, rights in know-how, patents and rights in inventions (in all cases whether registered or unregistered and including all rights to apply for registration) and all other intellectual or industrial property rights in any jurisdiction) in any information, content, materials, data or processes contained in or to this Web Site belong to Environmental & Gas Monitoring Limited or its licensed source. All rights of Environmental & Gas Monitoring Limited in such Intellectual Property Rights are hereby reserved. Environmental & Gas Monitoring Limited makes no representation that any product or service referred to on or through the Web Site is appropriate for use, or available in other locations. The information and other materials contained in this Web Site may not satisfy the laws of any other country and those who choose to access this Site from other locations are responsible for compliance with local laws if and to the extent local laws are applicable. Certain (hypertext) links, advertisements or suppliers promotion will lead you to Web Sites that are not under the control of Environmental & Gas Monitoring Limited. When you activate any of these links, you will leave The Environmental & Gas Monitoring Limited Web Site by opening a new window and we have no control over and will accept no responsibility or liability in respect of the material on any such other Web Site. By allowing links with third party Web Sites Environmental & Gas Monitoring Limited does not intend to solicit business or offer any security to any person in any country, directly or indirectly. Every effort will be made to carry out the contract but its due performance is subject to cancellation by Environmental & Gas Monitoring Limited or to such variation as we may find necessary as a result of inability to secure labour, materials or supplies or as a result of any act of God, War, Strike, Lockout or other labour dispute, Fire, Flood, Drought, Legislation, or other cause (whether of the foregoing class or not) beyond the sellers control. The guarantee provided by Environmental & Gas Monitoring Limited specifically excludes faults caused by accident, neglect and misuse.